I was lucky to spend Friday evening and all of Saturday at the Sun Valley Fibers January Thaw, knitting, laughing, and buying (a reasonable amount) of yarn. Sun Valley Fibers is run by Jeanette and her husband George, who have a farm in southwest Wisconsin. 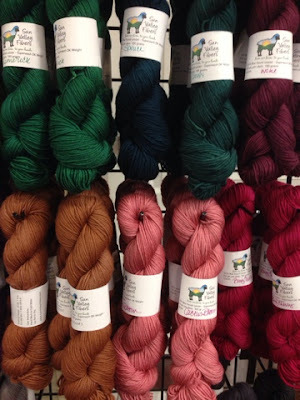 They dye up rich colors on a variety of artisan yarns. Three years ago they started up a retreat right here in Madison. How can I not go? No travel costs and I can drive home each night. Although, next year I'm going to spend one night at the hotel. It doesn't quite feel like a get-away when you drive home! Even with going home at night, it was a lot of fun. I met up with some of my favorite knitters and met new people from Madison, Milwaukee, Chicago, and the Twin Cities. 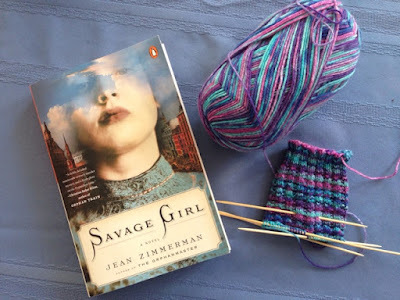 Just spending time with so much of Jeanette's yarn is inspiring. I had a lovely, mellow day today hanging out with my parents. But now I'm home and it's Sunday evening and I have to get ready for the week! 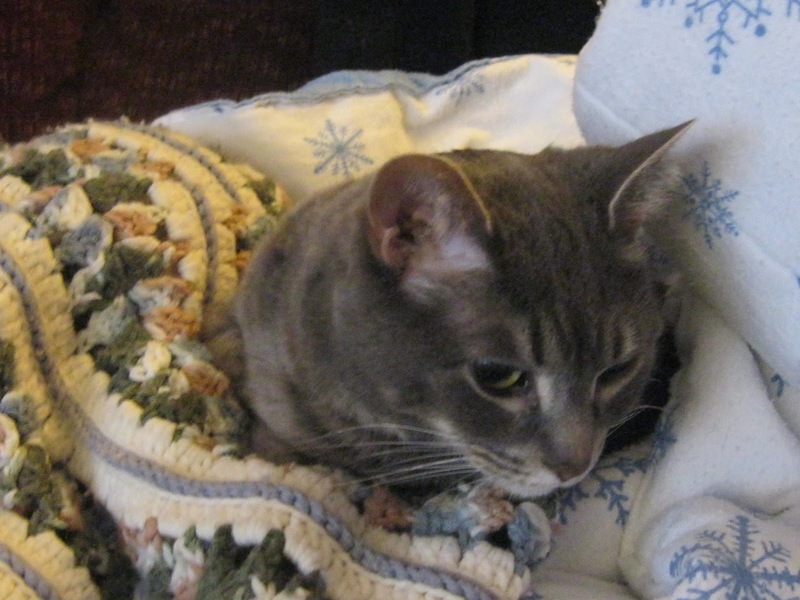 It has been a full week since I blogged, but I have been trying to read your posts. My apologies for those of you I have missed; it is a super busy time at work. I've been at school from 7 a.m. to 5 p.m. or later. And, because Keith is skiing in Wyoming for the week, we had a real snowfall Monday night. I love snow, and I like shoveling the sidewalks -- but not on such a tough work week! Yes, I am a wimp! I have done a little more on my Winter Ridge Poncho. The rounds are long and slow! But the yarns are so beautiful. I'll take a photo in natural light over the weekend so you can see for yourself. Please excuse the flash photo. I'm never home in daylight. 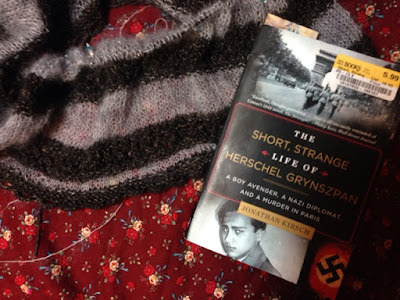 I put Savage Girl aside after I stumbled on The Short, Strange Life of Herschel Grynszpan when I was selling books at Half Price. It's the true story of a 17-year-old boy who shot a Nazi diplomat at the embassy in Paris in 1938. Hitler used the incident to set off the night of attacks on Jews knows as Kristallnacht. It is a heartbreaking and gripping narrative. I'm joining at Ginny for Yarn Along. 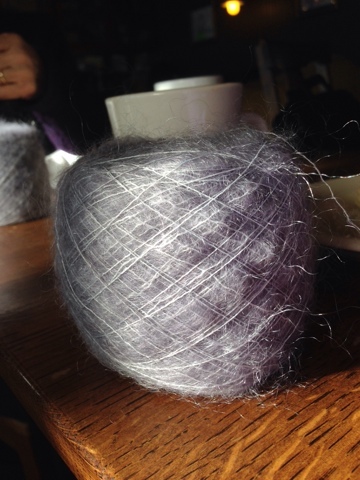 I did a stash dive this past weekend, looking for some sock yarn that had a decent amount of purple in it. A purple-loving friend dropped a strong hint that she'd like some handmade socks for her upcoming 60th birthday. Since I usually grab onto any excuse to hit a LYS, I am feeling quite proud of myself. 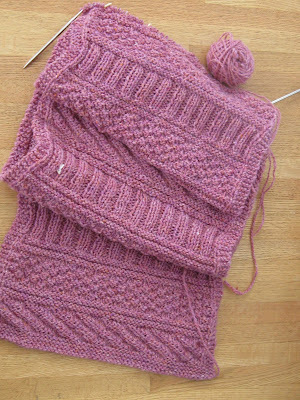 I'm knitting up a skein of Regia that I bought a long time ago; the ball band is long gone. 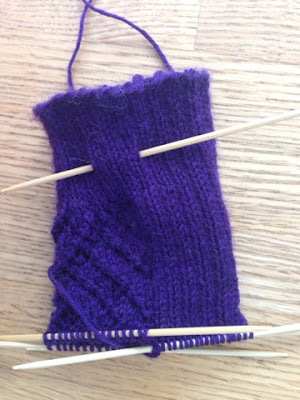 I"m knitting it up in my new favorite sock pattern, Blueberry Waffle. I picked up Savage Girl because it got a good review from the New York Times and it's about a topic that just fascinates me: feral children, the kind allegedly raised by wolves (or some other animal). It is very, very slow to start. I'm on page 80 and the plot is just beginning to take off. I'll be joining Ginny today for Yarn Along. 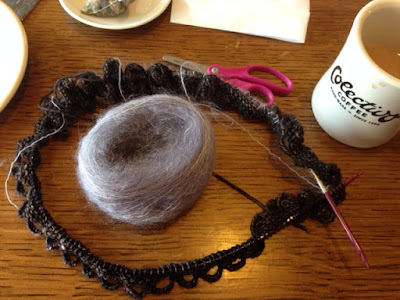 At the Madison Knitting Guild a couple months ago, my friend Marsha and I decided to do a knit-along. Every month we swear we aren't going to be tempted by the vendors at the meeting, and most most months we fail. One of the vendors was Ewetopia, a store about an hour away, in Viroqua. 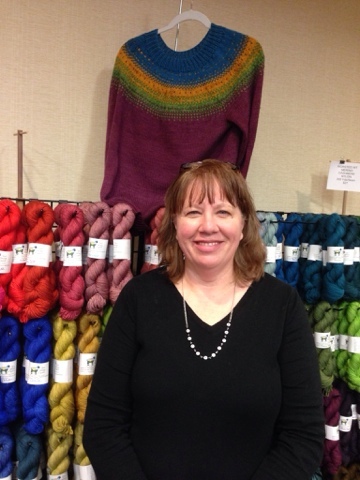 Owner Kate Ashley-Wright is a talented dyer and designer, and there was lots of yummy stuff to look at and pet. 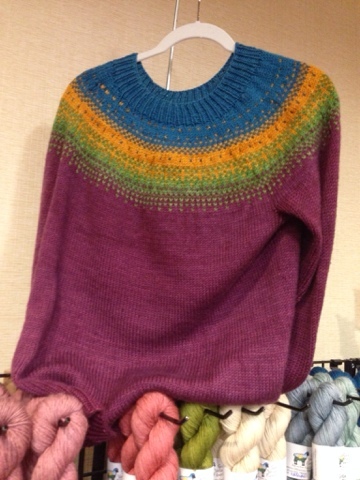 One of her kits on display was the Winter Ridge poncho (she calls it a cowl shawl). We didn't think much about it until we noticed that a good number of the other knitters were wearing it. 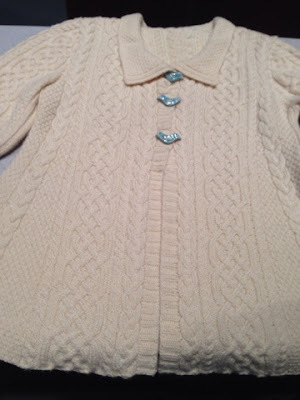 Then we fell in love with it, and decided to knit it together in a gray cashmere/silver mohair combination. It's good thing that we decided to work on it together. 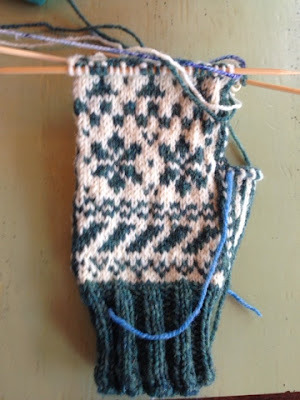 You start at the bottom with a loopy edging with is very pretty, but also quite tricky to figure out. It took both of us to figure out the directions and get it right. I am sure Marsha will finish far ahead of me. Not only does she knit faster -- she's a picker and I'm a thrower -- but she is retired! That's OK. I love the way this is coming out and it will be worth the wait. As you can see, the top is way too pointy so I'll need to rip that back. 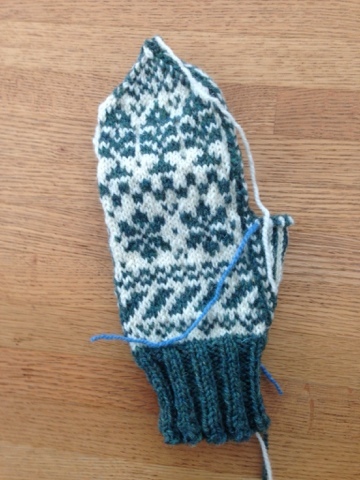 I've done this type of thumb before, so I'm almost ready to knit the first "real" model. I'm excited about that. The process sounds interesting and worthwhile. 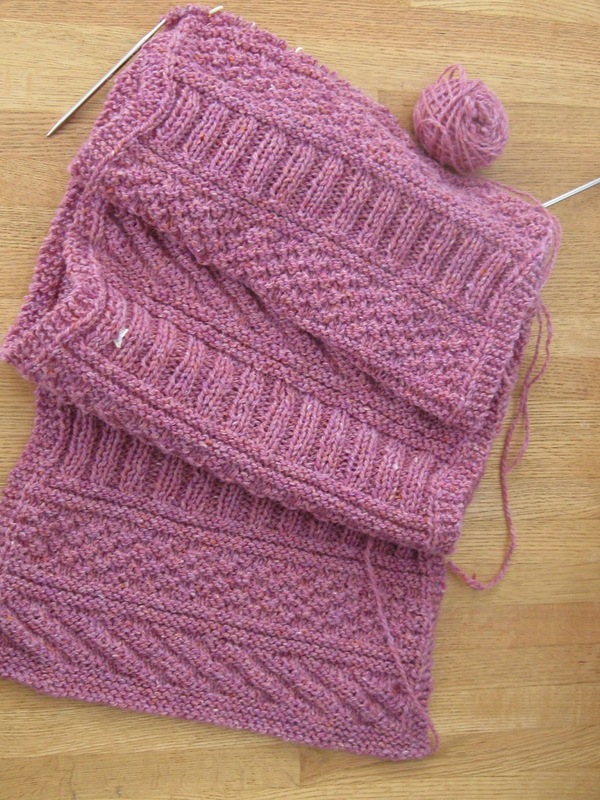 I don't see myself doing it because there is much that I want to knit that I think I'd get frustrated spending my knitting time on swatches. 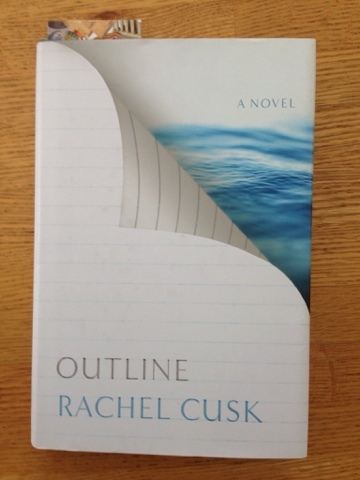 I'm trying to get through Outline, and I am about to admit defeat. The writing is beautiful and the level of detail is impressive, but the story is totally lost -- to me, at least. I'm joining up with Ginny today for Small Things. I just love the lace portion. It's geometric with very clean, modern lines. I have always struggled with knitting dark yarn, so I'm trying to work on this when I can use sunlight. Even our pale winter light is better than artificial lights. And remember this messy picture from a recent post? This is how it turned out. Here is my stash in a much more presentable form. Now, I want to point out that most of these crates are not full. I just like to organize my yarn by weight. The bag on top of the crate in back is filled with yarn that is going to school with me. Next year I may have two boys who knit! 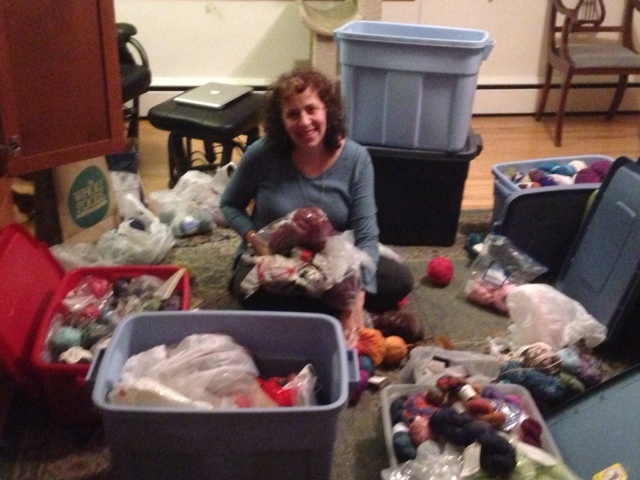 And the bin is filled with yarn that is going to be sold at our next yard sale! That's progress. If only the rest of my house was so orderly! I've been back to school for two days, and I'm already feeling overwhelmed. So much paperwork! At least I know I'm know alone. NPR ran a story late last year about how special ed teachers all over the country are buried in paperwork -- and leaving the field at an alarming rate. Nonetheless, knitting goes on! I've become quite enamored of knitting mittens -- so much so that I decided I had to try my hand at designing some. It's not that there aren't gorgeous patterns out there, but I wanted to create a design that had all my favorite elements. This is as far as I've gotten. If you look closely, you'll notice some errors. That's OK, this is an experiment. 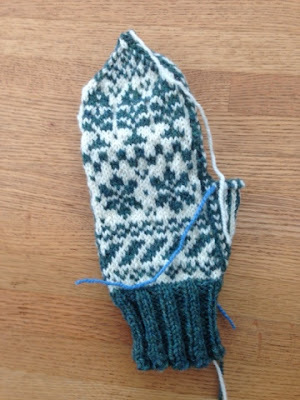 I'm using Briggs and Little Regal, which is perfect for mittens. It's rustic, but I like the way it feels on my hands. 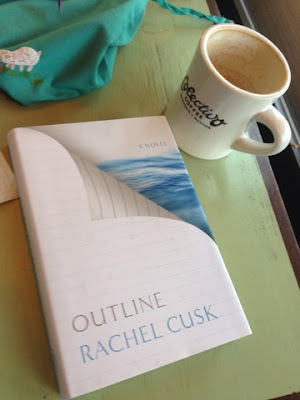 I'm reading Outline, a novel by Rachel Cusk. It turned up on a good number of the best-books-of-2015 lists. I've just started it, but I can say already that the writing is gorgeous. The structure is somewhat experimental and I'm interested in seeing if it works. You learn about the narrator by reading a serious of conversations she has with others. 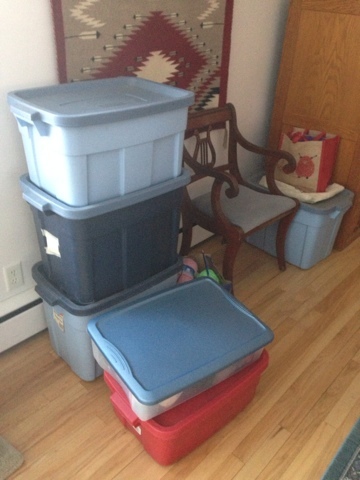 I didn't cull as much as I should have, but I did fill one bin with yarn to sell at a future yard sale, and another with yarn I'm going to use with my students. At least I've begun! The first day back at school was a good one. Go figure. I'm hoping the rest of the year will be much smoother and more enjoyable! Mid-morning I headed out with some friends for a walk at Indian Lake Park outside of Madison. It was snowy and beautiful and not too cold. Afterward we had a potluck lunch together. And tonight I'm having both my family and Keith's over for a very casual dinner. I hope you are having a lovely January 1. May we all have a healthy and happy 2016.